Over 40 years ago I played tennis in high school. Some years later, after I had my children, I tried introducing them to tennis. It didn’t go well. I was still a lover of tennis at heart and would watch the Davis Cup, Wimbledon, whatever I could when I had time. As I got older, I would occasionally visit a tennis court with my racquet and balls to hit overhead serves, walk around the net to the other side and repeat the process, pining for a game. I had tried finding someone interested in playing here in South Putnam County, Florida, but to no avail. On September 7, 2013, I sent a message on Facebook to my local gym, Putnam Family Fitness Center and asked them if they had anyone that would be interested in playing tennis. Here is the response I got: “We are launching a pickle ball program soon and will be playing in Morgan Park in Pomona Park.” On November 21st, I showed up at the park together with Bonnie, Marcia, Jim (the only person there that had ever played pickleball) and Hal (I think he had some idea what this pickleball thing was). Jim gave us all a quickie lesson on the rules and that was our introduction. The inaugural meeting of the pickleball group in Pomona Park. Bam! Kapow! There it is! Where have you been all my life? I am in love, obsessed, hooked like one of those catfish that I catch on the St. Johns River. Jim had marked out the lines on the old, cracked tennis court with masking tape. I didn’t care. I had somewhere to play and someone to play with. I sure hoped they were as crazed and obsessed as I am. Within a couple of weeks the peeling tape was transformed into painted yellow lines. Every Monday, Wednesday and Friday Marcia brings the equipment from the gym to the court. The equipment is there for anyone who shows up and wants to give pickleball a try. After two weeks, I had my own composite paddle. Jim arrives with a blower to blow the leaves and the acorns off the court. Nothing like having your opponent hit the ball to you and it hits the crack on the court or an acorn, shooting the ball off in a trajectory other than the intended one. Then there is the disadvantage of playing on the north side of the court. As soon as the sun comes up over the trees, we reach for our shades and hats, but we still can’t see those balls that are lobbed high. We reach up and hope that the racquet and ball make contact and that the ball finds its way back over the net. We laugh a lot. We now have about 10-12 regular players and love it when we get more experienced players visiting us, like Ed, Steve and Warren. I love to be challenged. 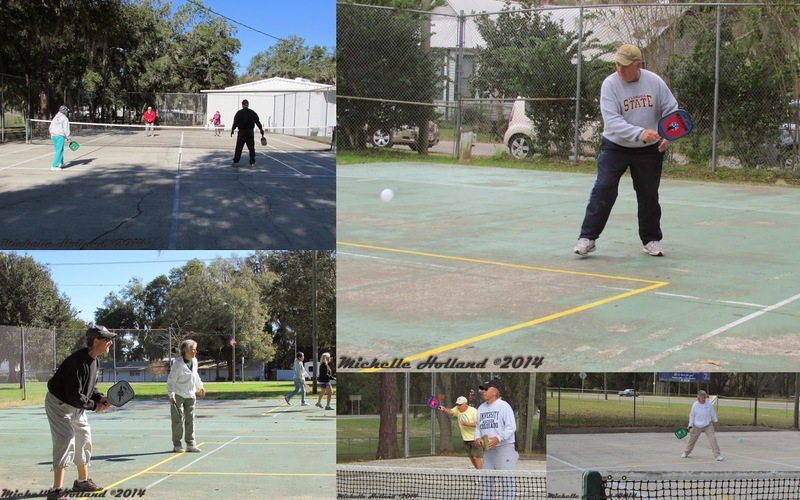 One day we got word that Crescent City, the town 7 miles to our south, was putting in 2 pickleball courts. Someone named Warren would be running the show down there. Warren is now a regular player at our court and we support his program in Crescent City. Warren is an experienced player and a good coach. He runs the program for the City of Crescent City and meets at the Eva Lyons Park on Tuesdays, Thursdays and Saturdays. We are now working on re-lining our tennis court into 2 pickleball courts to accommodate the players that keep showing up to learn. Putnam County, Florida, is officially on the pickleball map and I am a tennis player convert, never looking back. I love this game and look forward to seeing you on the courts.